The brains of humans and all other animals rely on communication between nerve cells (or neurons). Communication occurs at synapses, highly specialized junctions between neurons, where one neuron can secrete a transmitter to convey a signal to another neuron. In humans, the majority of synapses form during early prenatal and postnatal development, until about 1 year after birth. It is now widely accepted that changes in synapse function hold the key to our eventual understanding of how the brain encodes the major events responsible for development from birth to adulthood, and how neural events related to learning and memory are controlled. Synapse specificity and plasticity provide the structural and functional basis for the formation and maintenance of the complex neural network comprising the brain. The number, location, and type of synapses formed are tightly controlled, as evidenced by the fact that synaptic circuits are formed in a highly reproducible way. This implies the existence of cellular and molecular properties that determine the thousands of connections formed by each of the 100 billion neurons in the human nervous system. In the last decade, recent advances in molecular and cellular biology, combined with the development of sophisticated fluorescence microscopy tools to visualize synapses in live neurons, have revealed many intriguing and unexpected findings regarding the dynamics of synapse formation. Studies by a number of researchers have identified several critical protein components of synapses and have shown the time course of their arrival at the synapse. Several classes of molecules, including cell adhesion molecules, as well as scaffolding and signaling proteins, appear to serve as factors maintaining synaptic contacts between nerve cells. These proteinprotein interactions act to bring about the early changes in morphology and content of sites of contact between neurons, and determine which contacts are initially stabilized. In addition, there is evidence that these molecules can act later in life to determine whether the synapse becomes potentiated or depressed and that this process contributes to diverse learning paradigms. Several stimulating meetings were held in 2004-2005 whose goals were to discuss the recent advances in synaptogenesis. These included symposiums on Spinogenesis and Synaptic Plasticity (Westerburg, Germany) and Synapse Function and Plasticity (Vancouver, Canada) as well as a mini-symposium on Cell Adhesion Molecules in Synapse Formation (San Diego, USA). The idea of writing a book on molecular mechanisms of synaptogenesis was initiated by the latter conference, but scientific programs and contacts established during all three meetings were pivotal in helping us to formulate the concept of the book and recruit leading experts actively working on analysis of synaptogenesis to contribute chapters to the book. The excellence of their research and their enthusiastic support of our initiative have made it possible to share our excitement about the rapid evolution of the synaptogenesis field. It is clear that synaptogenesis, like long-term potentiation, is a long-term problem for neuroscientists. The complexity of synaptogenesis as well as major questions needing to be addressed are highlighted in the Overview section. The first group of chapters in Molecular Mechanisms of Synaptogenesis introduces and examines several experimental models (from neuromuscular junctions of simple organisms such as Drosophila to hippocampal cultures of mammalian species). This section of the book also includes a discussion of the advantages of these models and summarizes the most significant results gained through their use. Part II deals mainly with cell adhesion molecules, which have recently received a great deal of attention due to the multitude of their roles in synapse development. These molecules appear to be prominent players in all stages of synapse assembly, from contact initiation to stabilization and modification. Recent investigation into the roles of cell adhesion and extracellular matrix molecules in synapse formation has brought much insight into the basic principles governing the formation of glutamatergic and GABAergic synapses, as well as the neuromuscular junction. However, considering the existence of numerous cell adhesion molecules, it is clear that our understanding of the potential these molecules have for regulating the formation of synapses has barely scratched the surface. Moreover, the adhesion systems governing the formation of many other types of synapses, such as dopami-nergic and synapses remain largely unknown. Indeed, we hope that this book will stimulate research in this fascinating area. Parts III and IV deal with transport of synaptic components and the roles of cytoskeletal proteins and signaling molecules in assembly of synapses. These chapters demonstrate that through continued work to discover the many interactions and signaling cascades involved in these processes, a deeper understanding of the nuances governing synapse formation is gained. After synapses are formed and stabilized, their function is further shaped by life experience. Part V describes learning-induced changes in the structure and efficacy of synapses in different brain regions and focuses on trafficking of glutamate receptors as one of the central mechanisms underlying changes in synaptic strength. In this section the importance of synaptic modifications for learning and memory associated paradigms is discussed. Although the pursuit of a more profound understanding of the world around us has been enough to nourish the curious nature of scientists for centuries, the goal to alleviate the detrimental effects associated with mental diseases affecting people becomes possible only recently due to the drastic development of neuroscience. In this spirit, it has recently been determined that some of the critical molecules involved in building neuronal contacts are affected in psychiatric disorders such as autism and some forms of mental retardation. Also, a reduction in synapse number in specific brain regions has been found in patients suffering from various brain disorders. Thus, imbalance in synaptic contact formation may lead to abnormal neuronal circuitry underlying the aberrant behaviors manifested in these diseases. These recent findings therefore imply that major loss of neurons or neuronal populations may only be a secondary event reflecting problems in improper neuronal communication. Part VI provides a new compilation of information that links changes in basic synapse structure to brain diseases. The question remains, however: how can one exploit this knowledge to treat such diseases? Since a specific family of genes affected in psychiatric disorders has been now identified, one possible approach might be gene therapy. This would involve the introduction of an undamaged version of affected genes into neurons to either repair damage or prevent it before it occurs. Recent studies showed that specific secreted proteins and short peptides mimicking the function of neural cell adhesion molecules can significantly enhance the formation of synapses in the brain. Peptides that interfere with the function of receptors implicated in memory formation have been used recently to disrupt memories associated with addiction. These recent advances in basic research may lay the necessary scientific groundwork to develop pharmacological treatments targeting faulty synaptogenesis and allow neurobiologists to improve the lives of people affected by brain disorders. 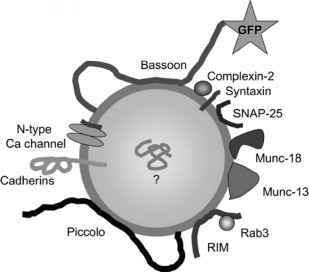 Thus, Molecular Mechanisms of Synaptogenesis will not only be useful for researchers, as well as graduate and undergraduate students in neuroscience, biology, and biochemistry, but it will also benefit students in medicine and nursing programs, expanding their knowledge of fundamental cellular mechanisms involved in the formation of synaptic contacts and communication between neuronal cells and how they are affected in brain diseases associated with abnormal neural wiring. Before you begin the journey of synaptogenesis laid out in this book, we leave you with three images shown below and in Colorplate 1: A contact is required for exchange of information between brain cells (image on left by Catherine Gauthier-Campbell), as it is for exchange of emotion between people (as presented by Promenade of Marc Chagall ; image in middle). This concept can also be expressed in an abstract form (as in the painting Synapses and Genes, the Building Blocks of Life by Alaa El-Husseini ; image on the right). This book is for you to explore the hidden dimensions of synapses. It may also help you one day see the Chinese concept of yin and yang intricately woven into an image of the perforated synapse.